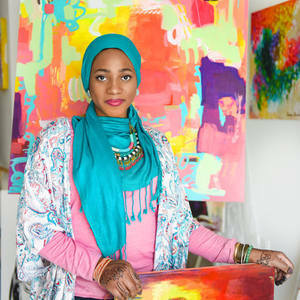 Email: [email protected] -- Amira Rahim is an American abstract painter currently based in the United Arab Emirates. Her work is marked by distinct vibrant color use, and seeks to uplift and raise the energy of a space. American abstract artist abroad in the United Arab Emirates. Her work can be found in both private and public collections throughout the UAE and North America. "My work revolves around the exploration of color and form to explore new ways of expressing emotions, energy, and occasionally, figures."